This dish can be on the table in 30 minutes, including marinating time. 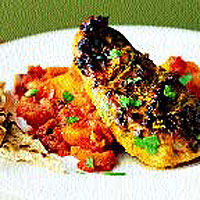 To make the marinade for the chicken, mix together the yogurt, curry paste and coriander in a bowl. Cut 3 deep slits diagonally in each chicken breast and add them to the bowl. Using your fingers, mix to thoroughly coat the chicken. Leave to marinate for 5-10 minutes. Preheat the grill to high. Place the chicken on a grill tray, drizzle with the oil and grill for 15-20 minutes, turning halfway through, until golden brown and thoroughly cooked, so there is no pink meat and the juices run clear. The edges should be a little charred. Meanwhile, cook the potatoes and the naan bread according to the pack instructions. Serve the chicken garnished with coriander on a bed of Bombay potatoes, with a dollop of the yogurt and the warmed naan bread.